Food Costs > How Much Does Basil Cost? How Much Does Basil Cost? Basil, which originated in India, is a herb that has a strong yet sweet smell that can be found in many Asian, Thai, and Cambodian dishes. Common types of basil found on the market includes African Blue, Globe, Hoary and Lettuce Leaf. Certified organic fresh basil leaves can cost anywhere from $8 to $20 per pound. This basil can be found at various farmers markets or even specialty grocery stores. Non-organic basil can cost $5 to $12 per pound. 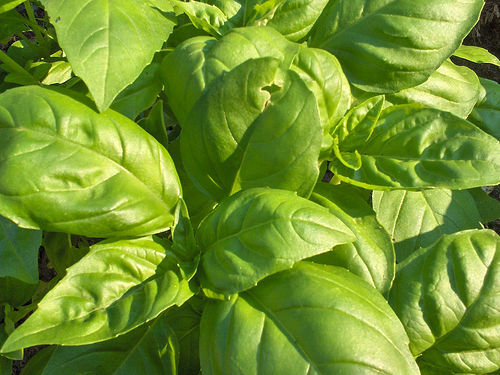 farmersdaughterherbs.com, for example, sells their basil for $14 per pound, $8 per half-pound and $1.50 per ounce. For smaller amounts of basil, you will most likely pay between $0.50 and $2 per ounce. At Walmart, they sell 0.75 ounces for about $2 the last we checked. In a local grocery store, small spice containers filled with dried basil can cost $1 to $5 per 5 to 10-ounce bottle. For the stalks only, basil can cost $8 to $15, but if you want to purchase the leaves only, it can cost $13 to $18 per leaf. For a full plant that can be planted or used, the price will be in the $6 to $11 per plant range. Specialty herbs such as purple, African blue and cinnamon, can be close to 30 percent more, depending on the seller. Refer to our table below to see what prices we found. African Blue A tall variety that can be found in floral arrangements. It has a scent similar to mint and peppers combined and will be found in meat and rice dishes. $6 per four-inch potted plant. Cardinal Identified by its red leaves, this basil has a stronger spicy scent and will be used in vinegars and oil. $6 per four-inch potted plant. Basil works great with other food such as olive and garlic. The leaves are going to be the best part of the plant. While the smaller stems can add flavor, they can tend to be a tad bitter compared to the rest of the plant. The creamy white flower in the middle of the plant is edible. Instead of throwing it out, look for some recipes that use it. To get the most flavor out of basil, consider using it right at the end of the cooking process. The longer you wait to put it in, the more flavor you’re going to get out of it. Dried basil can be used in a recipe if the recipe only calls for a smaller quantity, not as the main ingredient. When you do use dry basil, you will want to keep this ratio in mind: every two teaspoons of fresh basil will equal one teaspoon of dried basil. As for flavor, this quite a bit of difference when comparing the two. For starters, most herbs dried, regardless of the type, will create a very intense flavor than its fresh counterpart. If you cook with fresh basil, you will feel a “fresher” taste, while dried will give you more of an intense flavor. Dried herbs, such as basil, can also taste different because they lose a lot of flavor compounds during the drying process. If you’re worried about this, however, consider looking for “freeze dried” basil to keep these compounds intact. The first step is to make sure you harvest the leaves first thing in the morning, just after the dew isn’t present anymore. Before it gets too hot, cut the leaves from the plant and remove the stem, leaving about one-fourth of an inch above the growth node. Be sure to harvest more than you think you need because these leaves will shrink to more than half in size. When drying, there are two methods you can consider: You can either hang dry by cutting the stems about six inches long and bunching them together, placing a paper bag with holes punched in it around the bundles or you can use a food dehydrator. If using the hanging method, hang the bunches in a dark climate-controlled room, and as the basil dries, the paper bag will collect the dry leaves. If using a food dehydrator, lay each leaf in a single layer on the racks and dry until completely crisp. With these dry leaves, store them in an airtight container in a dark cabinet to prevent the leaves from losing its flavor. If exposed to too much light, the dried leaves may have next to no flavor when you want to use it. Store it in water away from the direct sunlight to keep it fresh for more than two weeks. Freeze the basil by removing and rinsing all the leaves from the stem, followed by spinning it in a salad spinner to make it as dry as possible. Place the leaves on a tray and set them in the freezer for about two hours. Once frozen, add them to an airtight container for future use. WikiHow.com also says you can simply stack the leaves in a milk carton with the top cut down. Create a basil puree, syrup or sorbet for future use. The Food Network recommends creating a pesto, infused oil, appetizer, soup, salad, pizza, fish dish, cocktail or dessert. Consider shopping at a local farmer’s market. This is a great way to get fresh organic basil. If you use basil often, consider purchasing in bulk. If you have a garden at your home, you can purchase a grow your own garden herb kit. These kits can cost $6 to $12 and will include basil along with other herbs you may enjoy. You can also purchase plants from online retailers. Popular basil plants include the Basil Genovese, Italian Large Leaf Basil, Lemon Sweet Dani and Basil Amethyst.